Confession: I'm addicted to Chex Mix — homemade Chex Mix, that is. Whenever we are looking for a savory snack to enjoy for a couple of days, this is my easy go-to. I love it for boat rides and the beach in the summer, or for movie marathons and football season in the fall. It's so easy, you'll never be able to eat the bagged stuff again (and bonus points: your house will smell amazing while it bakes)! I've adapted a few recipes over the years, and this is my perfect blend. I like the flavoring to be nice and savory, so you can adjust the measurements to fit your personal taste. In a large bowl, combine all of your dry ingredients. Place the butter and minced fresh garlic in a glass bowl or measuring cup (I prefer this because it pours easily), and microwave until butter is melted. Add the Worcestershire sauce, onion powder, garlic powder, and seasoning salt. Whisk with a fork to blend completely. Pour the butter mixture over your dry ingredients, a little bit at a time, making sure to distribute it evenly. Using a flexible spatula, carefully stir the ingredients in the bowl – you can also use a spoon, but I find the spatula prevents the Chex from getting crushed. I like to pour a little butter mixture on, stir, then pour a little more, and stir again, to make sure the mix is evenly coated. I want no piece left behind! Once everything is combined, transfer the Chex mix onto a baking sheet (with sides), making sure it's spread evenly in one layer. Sometimes I use two baking sheets just to ensure the mix isn't too piled on top of itself, but it depends on the size baking sheets you have. Bake your Chex mix for one hour, stirring every 15 minutes. I know this sounds nuts, but it makes a difference. This is a bake-it-low-and-slow process. I like to just hang out in the kitchen and catch up on the Bachelor and mayyyyybe drink a few glasses of wine while I'm on stirring duty. And you can inhale the heavenly scent coming from your oven during this time. Once baked, transfer the Chex mix to a sheet of waxed or parchment paper and allow to cool. As much as I love things fresh out of the oven, this stuff really takes on its flavor once it's fully cooled. I let it sit for an hour or so before transferring it to an airtight container. Ah, the holidays. The time of year when booze flows like water, and rightfully so. There's nothing like a little buzz to make all the family gatherings better (or you can just rely on Adele to fix everything). Luckily, I don't have any crazy relatives to dodge, so a good holiday cocktail is more of a pleasure than a remedy. I tend to be a wine-with-dinner kind of girl, but starting off a party with a festive cocktail makes everything feel more special. This little drink has a pretty presentation that really says Christmas, and would look beautiful set up on a bar cart for a night of entertaining. I love the addition of the sugared cranberries – they look snow-covered and totally holiday ready. They are also really tasty on their own, so you can set out any extras in a little dish for people to snack on. This recipe is super easy and you can scale up the recipe depending on your number of guests (or if it's just you...ain't no shame in that game). Fill a cocktail shaker with ice. Pour in cranberry juice, apple juice, and gin and shake to mix. Pour into rocks glass with ice, and add your ginger ale. Garnish with a sprig of rosemary and sugared cranberries – you can place them loose into the drink, or line them up on a toothpick or cocktail pick. In a small saucepan, combine cranberries, water, and 1 cup of the sugar. Heat on high until the water begins to boil, then remove from the heat. Let them stand for about 5 minutes – you want the cranberries to be whole, and not split open (a few of mine did anyway). Once they're ready, drain the liquid and transfer the cranberries to a plate to cool for a few minutes. On another small plate, place the remaining 1/2 cup of sugar and roll the cranberries in the sugar, a few at a time. Place them on another plate or prep board to cool and dry for 10-15 minutes before inserting cocktail picks for garnish. And that's it! You're on your way to holiday cocktail party bliss. As if the leftover Halloween candy wasn't enough, I made these brownies this past weekend while craving the toasty flavor of s'mores. 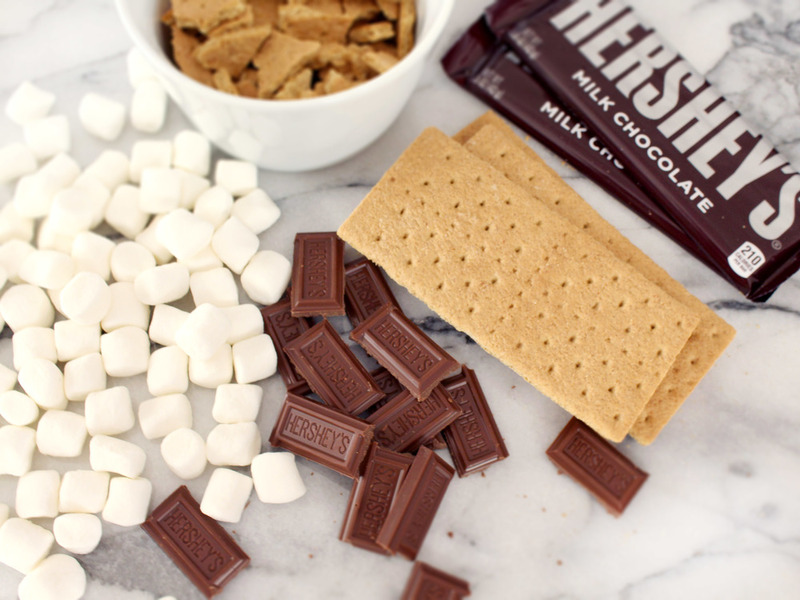 I love making s'mores in the summer, but there's something about this warm fall weather that's keeping me in the mood for bonfires and toasting marshmallows. This is hardly a recipe (which is why it's awesome) but it's a super tasty way to upgrade a batch of brownies. Prepare and bake your brownies according to the instructions on the box. As soon as you remove them from the oven, sprinkle the mini marshmallows evenly on top, allowing them to warm a bit when they make contact with the brownie pan. Turn on the broiler in your oven to the high setting. Sprinkle the graham pieces on top of the marshmallows. Once the broiler is ready, pop the pan back into the oven (with the rack positioned a notch or two from the broiler) and allow the marshmallows to toast for about 30-60 seconds. The timing depends on the heat from the broiler – keep an eye on them to make sure the graham crackers don't start to burn. You'll want to leave the pan in until the marshmallows are golden brown and melty, so it could take longer than 60 seconds. Every year, I find myself browsing the Williams-Sonoma fall catalog and lusting after their awesome seasonal products. I couldn't pass on this super cool mini skull cake pan this time around — they're the perfect serving size for a Halloween party, and can be decorated differently for an impressive display. I used a boxed red velvet mix for the cake, and whipped up a batch of buttercream for piping the details on – this is the recipe I follow. I would also love to try filling the cakes next time – maybe from the bottom – to add a bit to the frosting/cake ratio (in my opinion you can never have too much frosting)! These would also be great as a molten cake with a ganache filling, as seen here. It's like chocolate blood...so cool for Halloween. Well, another week has begun – I hope you guys had a great Easter! It was so nice to have Friday off, it was a much-needed long weekend and I spent the day tying up loose ends with wedding stuff and working on the new website, which is coming soon! On Easter Sunday we had a little brunch at our house, just the two of us, then visited family for dinner. One of my favorite cakes EVER is carrot cake, so it felt appropriate to bring along for the Easter Bunny feast. I prefer nuts and raisins in my carrot cake, but I left them out in case those weren't crowd pleasers. The cake was still awesome and didn't feel lacking, so it's just personal preference! I've adapted this from various recipes, and this is what works for me. I hope you try it and enjoy...it's delicious! Preheat oven to 350°F. In a large bowl, combine flour and dry ingredients (spices, baking powder, baking soda, salt) and set aside. Mix oil, brown sugar and granulated sugar in the bowl of a stand mixer until smooth. Add eggs and vanilla slowly and continue mixing. Gradually add the dry ingredients and beat on medium speed until combined. Fold carrots into batter with a spatula just until combined, then add in nuts and raisins. Be careful not to over work the batter, just fold until combined. Grease and flour two 9" cake pans, and pour batter evenly between the two. Bake for 35 minutes or until a toothpick comes out clean from the center. Place pans on a wire rack and cool completely – this usually takes a couple hours, so now's the time to make your frosting. Before I frost the cake, though, I like to pop it in the fridge to chill down – a cold cake will be much easier to frost. In your stand mixer, beat together the cream cheese and butter until smooth. Mix in the vanilla extract. Slowly add the powdered sugar one cup at a time, adding or subtracting based on desired thickness. You can add milk to thin the frosting, or add more powdered sugar to thicken it up. Carefully run a table knife between the cake and the pan to loosen the cake, then flip the pans upside down to release the cake. Using a sharp serrated bread knife, level off the rounded tops of the cake layers. Place your first layer on the plate or cake stand, followed with a big dollop of frosting in the center. Spread the frosting thickly and evenly across the layer – don't worry about it being perfectly smooth, just try to get it even. Spread from the middle of the layer out to the edges and slightly down the side. Add your second layer, centered on top of the first. Repeat the frosting process by starting with a large dollop on the top and work your way down the sides, filling and smoothing with an offset spatula. Check out this helpful video with instructions on how to achieve a smooth finish with your frosting. Carrot cake doesn't demand a lot of embellishment with the icing, so I made a few calligraphy flags to jazz up the cake for the holiday. You can serve the cake right away or pop it in the fridge to cool down and set, which I like to do with cream cheese frosting. You'll want to store your cake in the fridge when you're not devouring it. And that's it! Pure carrot bliss. Happy Friday, everyone! Hope you're all staying warm in these arctic temperatures. It's bitter cold outside so we definitely don't have any major plans this weekend (although Cleveland Restaurant Week starts today, so I might be tempted into attending)! Most importantly, I'd like to announce the results from the Sephora gift card giveaway—the winner is Kayla Kelsey (@kaylaincle)! You'll be receiving an email from me shortly with the details of your prize. And it appears she's also a bride-to-be, so double congrats to you, Kayla! Thank you all for entering and commenting about your skincare routines—I am such a product junkie and loved all of your recommendations. I've had a few questions about daily-use products, so I plan to do a follow-up post on that as well. In the meantime, I rounded up some tasty detox water recipes for anyone who's looking to spice up their water game. Enjoy! 2 | Lime Raspberry Mint water (Sammy and Bella) - I'd love to try this with basil! When it comes to summer, there are few drinks I like better than sangria. It's the perfect refresher that packs a mean alcoholic punch (well, at least when I make it). I am a repeat offender when it comes to making peach sangria, so wanted to dig up some other recipes to inspire some interesting combinations. We have a bunch of mint growing in our garden, so I'm anxious to use some up with the apple mint white sangria pictured at #4. I love the idea of mixing in some herbs or veggies, like cucumbers or even sweet peppers, for a twist on this classic. Now that the nights are long and warm, sangria makes for an ideal patio companion. Time to get that pitcher out! It's been years since I had one and the craving hit me while grocery shopping this week. I resisted buying a box and instead found this recipe to make my own. These were actually very easy to make and have all of the soft, chewy goodness of the original. I followed the recipe exactly and was sure to slightly underbake the cookies to keep them really soft. Head over to Cooking Classy to find out how to make them yourself! Do you have a childhood snack you just can't resist? Between the freezing weather and catching the flu, this week's been a bit of a doozy. I'm looking forward to recharging this weekend and starting fresh next week. I'll have some fun Valentine's DIYs and printables coming up — I can't believe February is around the corner! Enjoy this week's links and have a cozy weekend! There are few things I like more than birthdays and cookies. And since my favorite dessert (cookies) usually take a backseat to my other buddy (cake) on birthdays, I was extra thrilled when I could find a way to bring the cookie back to the party. When I spotted this recipe over on Sally's Baking Addiction I knew it was L-O-V-E. These are perfectly colorful, chocolatey, and packed with cake batter flavor. She has tweaked and tweaked this recipe to make the perfect pillowy-soft cookie, so I'll lay it all out for you so that these babies can get into your mouth ASAP. 1) Sift flour, cake mix, and baking soda together in large bowl. 2) In a stand mixer (or separate bowl), cream together butter and sugars. Add in egg and vanilla and mix to combine. 3) Slowly add in dry ingredients to mixer; mix only to combine. You don't ever want to over-mix your batter at this point! Use a spatula to fold in the chocolate chips and sprinkles. Let your dough chill for at least an hour before baking. 4) Preheat oven to 350ºF. Roll dough into tall balls (trick from Sally) - this will keep your cookies from spreading too much. Bake for 10-12 minutes - mine took 13 because I use insulated cookie sheets. You'll want the edges to be golden brown but the centers will still look slightly underdone — never fear, they will settle as they cool. This will keep them chewy and soft! 5) Cool and serve with some milk. And maybe a slice of cake. These are definitely in the running to replace my next birthday cake. Enjoy!